This healthy side dish recipe has been adapted slightly to be dairy-free and optionally vegan. Put the stock, water, 1 teaspoon salt, ginger, cloves, nutmeg, and cinnamon stick in a medium saucepan over medium heat. Bring the liquid to a boil. Add the rice and bring it back to a simmer. Reduce the heat to low and half cover the pan with a lid. Simmer for 45 minutes, or until the rice is tender and the liquid is absorbed. Remove and discard cinnamon stick. While the rice is cooking, heat the oil in a large skillet over medium-low heat. Add the onion and cook, stirring frequently, until translucent, about 4 minutes. Add the butternut squash and cook, stirring often, until the squash is tender and beginning to caramelize at the edges, about 8 to 10 minutes. Add the apples and cook for 3 to 4 minutes, or until the apples soften. Season the squash mixture with with the thyme and cinnamon. Add salt and pepper, to taste. 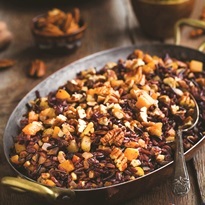 Stir in the chopped pecans and currants, and cook until the pecans are slightly golden and fragrant. Remove the mixture from heat. Stir the squash mixture into the cooked rice and season, to taste, with salt and pepper.